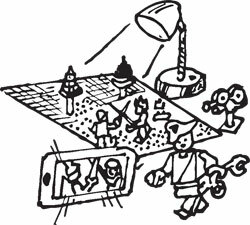 Make like a miniature Martin Scorsese and create your own (stop-action) movie. Best part? The actors are all Lego® people, who work for free. 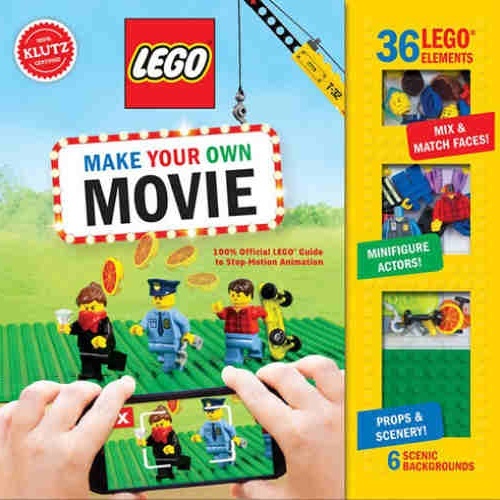 You’ll get (36) assorted Lego® pieces, including mix-and-match characters and props. Includes a 78-page guide with advice for making credits, sound effects, lighting, camera techniques, set design, backdrops, storyboards and a bunch more. If Hitchcock had had this kit, Janet Leigh might have survived the shower scene. 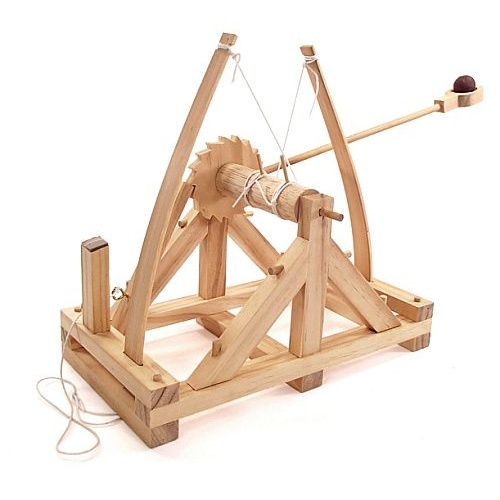 Based on drawings from Da Vinci's Codex Atlanticus, this Pathfinders catapult kit uses a pair of bent wooden arms as springs to launch clay balls (included) over (4) meters at enemy fortifications (not included, go make your own enemies). The assembled model will be approx 9" tall on a 10" x 7-1/4" base. Made from pre-cut, untreated wood from sustainable forests, and built with pegs for added strength and verisimilitude. 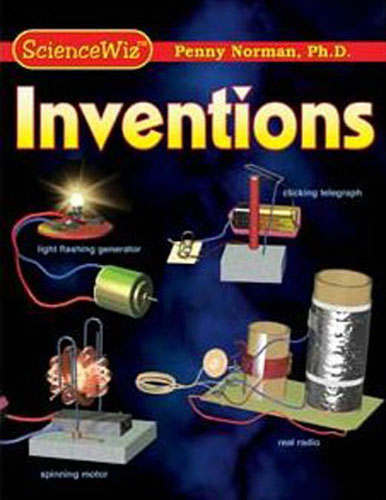 A 2013 Creative Child Magazine Top Toy of the Year Winner and a great resource for STEM activities. For ages 12 and up. 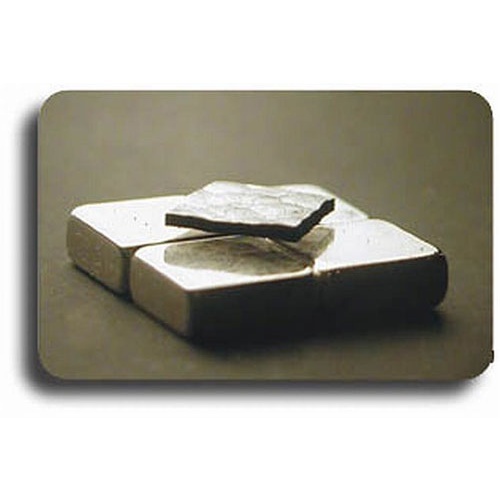 Physics faculty alert: It's very small, but teaches a powerful lesson, this little diamagnetic-properties demo kit. You get (4) plated magnets, each 1/4" square x 3/32", and (2) 1/4" square pieces of graphite to float above them. The graphite may have slight chips along the edge but that won't affect the effect. Includes instructions/fact sheet. Home robotics, bubeleh. Build a working hydraulic arm with this excellent 66-piece kit from Pathfinders' Simple Machine series. 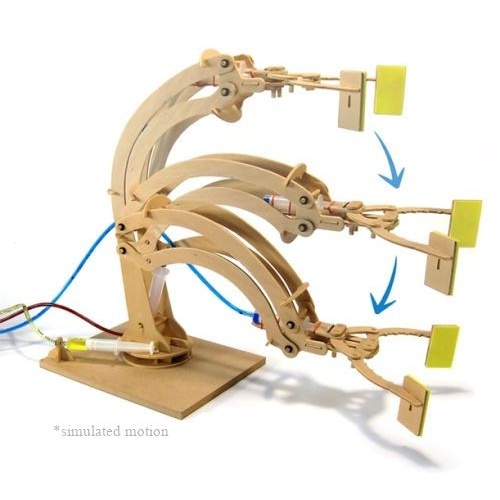 Structure is die-cut plywood and the kit includes tubing, (3) syringes and glue. You'll need a ruler and scissors. The finished arm will be approx 13-1/2" tall and will reach out over 16" and rotate 90° on an 8-5/8' x 6-7/8" base. Comes with a 12-page manual and uses water. Beautiful, too. For ages 8+. You can’t start fooling people too early. 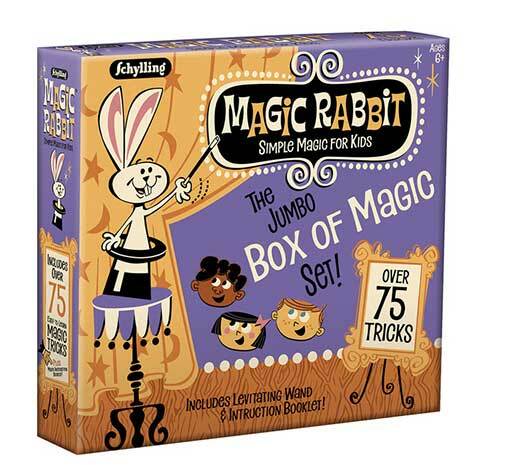 This box of tricks is for budding magicians, and includes the props and instructions for (77) tricks. Includes a magic wand, without which you can’t be a magician, plus assorted cups, balls, cards and coin-trick frames. You add a few things like money, a handkerchief, gullible friends, etc. For ages 6+. 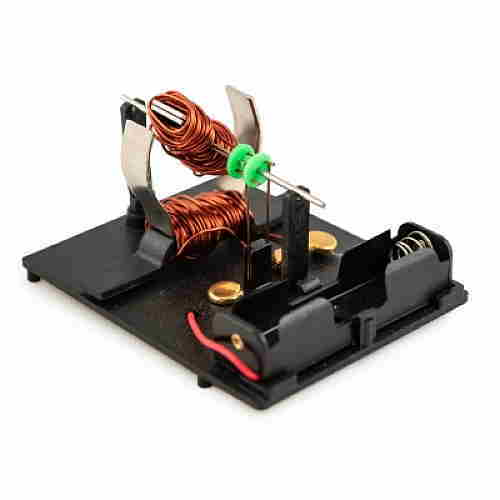 Everything you need to build a little DC motor is included in this kit (except sandpaper, screwdriver, scissors and, of course, an AA battery). The instructions are simple and explain the theory as well as assembly. Fun and educational. And teach a kid (8 and up) the basics of solar power. This excellent educational kit from Elenco comes with (9) 0.5VDC solar cells pre-wired in sets of (3) and mounted in a 5" x 4" x 7/16" black-plastic frame with screw terminals on the bottom. 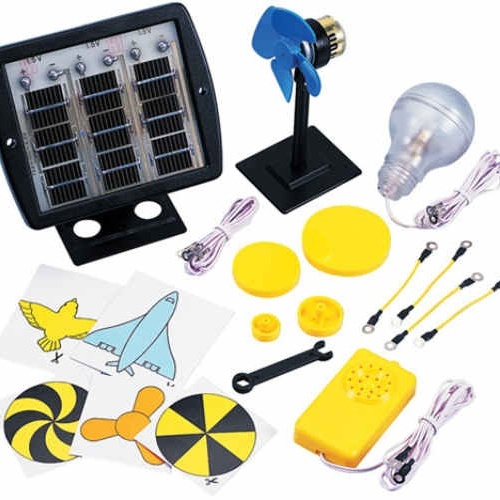 The kit includes a 1.5VDC motor with leads and a mount, a fan blade and (4) plastic discs from 5/8" dia to 2" dia for mounting on the motor shaft, a 1.5V incandescent bulb with leads, a sound module with leads, and graphic cards to mount on the discs. Comes with a 14-page instruction/experiment booklet, including info on increasing voltage and amperage, powering battery charges, radios, games, etc. Lots of science project potential. "Heuristic as all get-out," Jarvis said when he saw it. We spit on plastic. And so will you when you see these laser-cut bright steel models from Fascinations®. Snap-together pieces. The models are small, but worthy of permanent display, and designed for the grown-ups to assemble and display, rather than the kids to play with. You pick the Metal Marvels™ 3-1/2” long x 2-3/4” wide space shuttle Atlantis. (They aren’t making any more big shuttles, Pilgrim.) Or the 4-1/2” tall x 1-3/4” wide at the base MetalWorks™ Eiffel Tower. 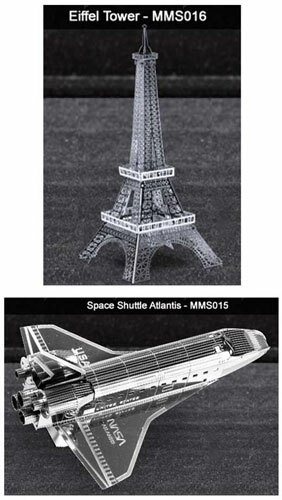 From Fascinations®, these small model kits are made from intricately laser-cut polished steel. Punch the pieces out from the 4-1/4" square sheet and put them together with the tiny tabs. 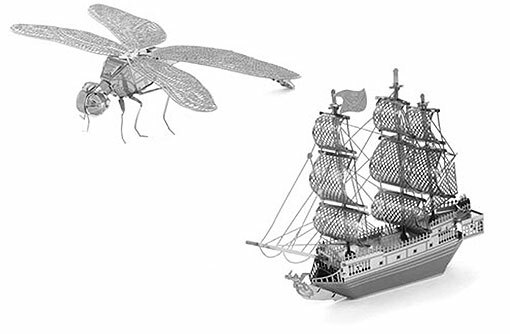 You pick the dragonfly, with a 4-1/2" wingspan or the Black Pearl pirate ship, approx 3-1/2" long. For ages 14+, because they take plenty of small motor skills. 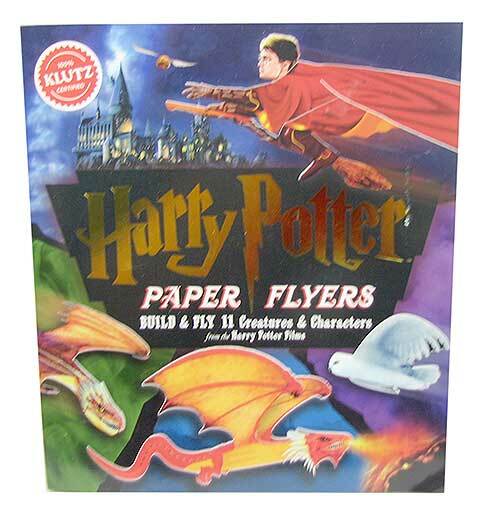 This 50-page book has the materials and plans for making a total of (11) Harry Potter fliers, including the above-mentioned plus the Chinese Fireball, Harry and Draco Quidditch, the Golden Snitch, Norbert the Norwegian Ridgeback, Hedwig the Snowy Owl, Fawkes the Phoenix and Gringotts Dragon. Includes lavish illustrations and a flight log.